A drunk driver who collided with an oncoming vehicle, killing one of his passengers, has been jailed for seven years and four months. The collision happened on the A469 near Hengoed, Caerphilly county, when Lee Hillier, 30, lost control, hit the kerb and crossed the carriageway. His Seat Leon hit an oncoming van, killing passenger Jason Clarke and seriously injuring two others. 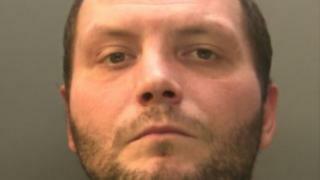 He admitted three charges relating to January's crash at Cardiff Crown Court. These were causing death by dangerous driving and two counts of causing serious injury by dangerous driving. A blood sample taken by police showed alcohol in Hillier's system was more than twice the legal limit. "Lee Hillier ignored pleas from his passengers to slow down," said the Crown Prosecution Service's Jamie Dewar. "The collision which followed had dreadful consequences." He said his thoughts were with the family of Mr Clarke and wished a quick recovery to the two other passengers in the car.